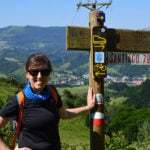 "Excellent service form start to finish could not fault it and we all had an amazing experience and will use Camino ways again for our next trip. Which we are already starting to plan!!!" "We did it ... now I want to do it all again. From the first contact I made with Camino Ways I felt that I was dealing with a company that knew how to organise in an effective and efficient way. Replies to email were prompt and the service always very friendly. The instructions were always very clear and nothing was too much to ask. 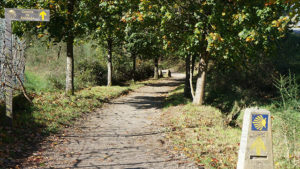 The Camino itself was enhanced by the organisation of Camino Ways. All accommodation was first class and the transfers to hotels etc. were fantastic. 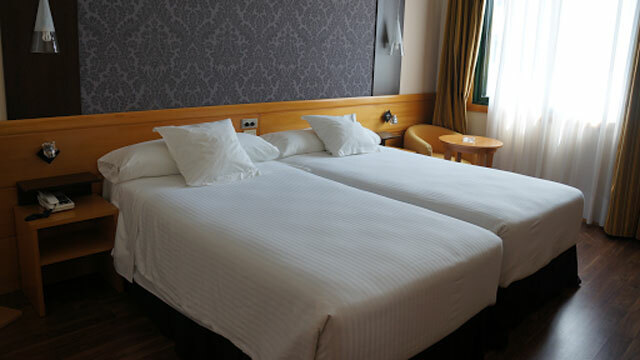 We really enjoyed the variety of places to stay and felt safe and cared for all the time. Well done ... I am already thinking about next years Camino ... that is when I stop remembering this one. Thank You Camino Ways"
We had a memorable Camino walk for our 30th wedding anniversay, together with 2 other couples. We started in Sarria and walked for 6 days. CaminoWays planned the walk for us and everything went smoothly. Our suitcases were always waiting for us at our destination. They recommended an upgrade to the Parador at Santiago, and though it inflated the cost of our package, it was worth every Euro! And I would use CaminoWays.com again without any hesitation. If you are looking for the classic Camino experience, this is the perfect tour for you! You will be walking the last 100kms of the famous Camino Francés from Sarria to Santiago de Compostela over 7 days, across the green rolling landscapes of rural Galicia. This is our most popular Camino trip and perfectly captures the essence of the Camino de Santiago: Meet fellow pilgrims, discover local traditions and enjoy the unique atmosphere of it all, rewarding yourself with good food after your day’s walk. You begin your Camino trip from Sarria, the most popular Camino starting point, and you walk the last stage of the Camino Francés over a week. This means you can receive your pilgrim certificate at the Pilgrims Office when you arrive in Santiago. With your ‘Compostela’ certificate in hand, it is time to explore the magic of Santiago’s Old Town, a wonderful UNESCO World Heritage city. *This is a standard week-long package, however you can add extra days to shorten your walking stages or stay additional nights in Santiago. Ask our team for advice. This route has excellent reviews with many 5 star ratings. For a guided version of this tour, go to: Classic Camino guided tour. After your night in Sarria, expect a calm walk through pretty villages and peaceful hamlets under the shade of oak trees and along quiet country roads. 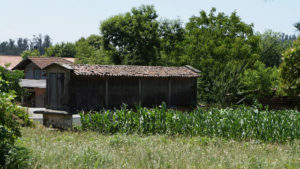 Along the way, you will spot many Galician traditional ‘hórreos’ (granaries). Visit the beautiful Romanesque church in the village of Barbadelo. Your destination for the night is the town of Portomarin. 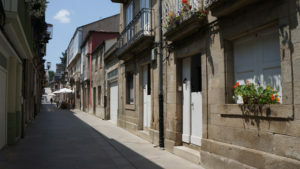 Easy Option: You can choose to split this day between Sarria and Portomarin in two and stay in the hamlet of Morgade. 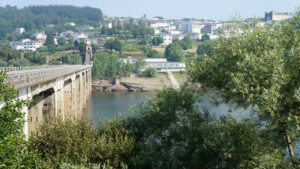 After your night in Portomarin, your Camino will cross the river Miño (Galicia’s longest river) and rise uphill steadily towards the Serra de Ligonde. You will pass nice hamlets such as Gonzar and Ventas de Narón. Stop to visit the Romanesque Church of Santa María in Castromaior and the Romanesque church in Eirexe, with its portal featuring a sculpture of Daniel with animals, as well as Pilgrim Santiago. Easy Option: You can choose to split this day in two and stay in the hamlet of Ventas de Narón. After your night in Palas de Rei, the Camino trail continues downhill, passing the village of Casanova and the delightful village of Leboreiro. You should take a break in the lively market town of Melide (454m), where you should try octopus, Galicia’s most classic dish, in one of the many ‘pulperías’. The Camino crosses several streams and follows a forest track bringing you to the village of Boente and the church of Santiago. Next is the pretty medieval hamlet of Ribadiso and finally the town of Arzúa (389m), famous for its local cheese. In Arzúa, you should visit the churches of Santa María and A Magdalena. After your night in Arzúa, your Camino will take you through pretty woods, sleepy villages and across streams for most of the day. The chapel of Santa Irene, with its unique statue of Santiago, is worth a visit. En-route, don’t miss the lovely hamlet of Rúa (310m) where you can choose to stay tonight and split this walking day. The rest of the route to Amenal is along a mix of good and calm country roads and forest tracks. 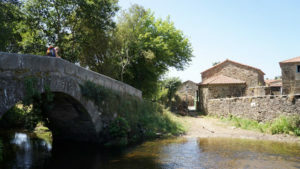 After your night in Amenal, your next point of interest is Lavacolla in the outskirts of Santiago, where pilgrims used to wash themselves in the river in preparation for their arrival in Santiago de Compostela. Rows of tall eucalyptus trees line your journey to Monte do Gozo (‘Mount of Joy’ 368m) and it is from here that will catch your first glimpse of the spires of the cathedral in Santiago. When you arrive in the city (264m, population 80,000), explore this UNESCO World Heritage Site’s architecture and delight in the wonderful atmosphere of this spiritual and cultural city. With only 16.5km to walk today, you should be in Santiago in time for the pilgrim mass (12pm). After visiting Santiago Cathedral and recovering from your walk, take time to explore this gem of a city, small and vibrant. Its old town will enchant you. 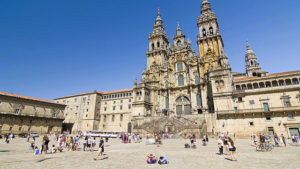 In Santiago the Compostela you will find not only pilgrims but also locals and students, enjoying a few bites and socialising over a glass of wine in the many bars, restaurants and cosy cafes. Read our blog post: Top 10 things to do in Santiago de Compostela for ideas before your trip. Superior Collection now including complimentary spa treatment in Santiago. Easy Option: Last stop before reaching Santiago. Choose to stay in Lavacolla and after a deserved rest, arrive in Santiago the next day feeling refreshed and calm. End of your Camino de Santiago tour after breakfast the next morning. 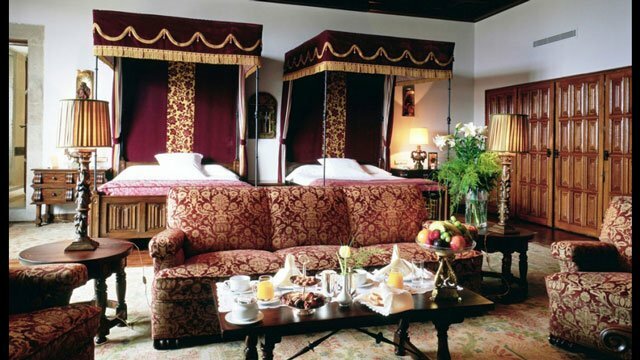 Consider adding an extra night in this gem of a city or perhaps a day tour. Country Cottages or ‘Casas Rurales’ are beautifully restored country homes and farmhouses in the heart of peaceful rural communities. 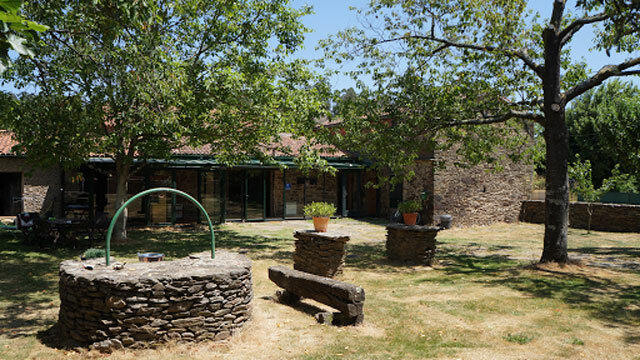 Our Country Cottages are renowned for their exceptional food, unique settings and personal touch. Rest assured when you select Country Cottage you will enjoy the full experience of our collection of beautiful Casa Rurales when and where this option is available, however bear in mind, that sometimes due to location factors, only our choice of standard collection hotels and guesthouses may be available. Santiago de Compostela Airport 120km: Fastest is to take a combination of 2 buses: First, from Santiago airport to Lugo bus station (1h50, everyday at 7:10, 11:10, 16:10, 18:40 + 20:10 except on Saturday). See: www.empresafreire.com. Then, take a local bus from Lugo bus station to Sarria bus station (30min). Total cost for journey roughly €10pp. Alternatively, you can book a taxi transfer from Santiago Airport to Sarria costing approx €120. Or a taxi from Lugo to Sarria cost approx €50. There is also a direct bus between Santiago de Compostela bus station and Sarria but only departing once a day (except Saturdays and Sundays), approx. 2h30 travel time. See www.monbus.es. A Coruna Airport 120km: In A Coruña, there is a bus from the airport to the train station (Line 443 stop: Avenida A. Molina) departing every 30 min, see www.autoscalpita.es. There is a direct train from A Coruña to Sarria four times a day (2h-2h30). See www.renfe.com. Vigo Airport 180km: From Vigo you will have to travel to Santiago de Compostela by bus (1h) www.movelia.es or train www.renfe.es; and then follow instructions from Santiago to Sarria above. Madrid Airport 487km: In Madrid, there is a train from the airport (Terminal 4) and the train station (Chamartin). There is a night train from Madrid Chamartin to Sarria (once a day/ 8h30), as well as three other trains per day connecting Madrid and Sarria (one direct, two with change of train, 6hr approx.). For details, times and tickets, see: www.renfe.com. It is also possible to take a bus from the airport in Madrid to Lugo (3 times a day, taking 6h30-7h30). From Lugo to Sarria you can take a bus from the bus station or a train from the train station (4 times/ day – 30min). The bus and train stations in Lugo are approximately 1km apart (taxis are also available at the stations).